How we've enabled world class vapour deposited Perovskite solar cell research utilizing our line of Organic Material Deposition Systems. How we've enabled world class vapour deposited OLED research utilizing our line of Organic Material Deposition Systems. KJLC Dual Wedge Tool turns your single substrate in to multiple substrates without the need for breaking vacuum or complex masking. This Combinatorial (producing multiple substrates with different materials and thicknesses on a single substrate) approach cuts down expensive and prolonged research time allowing for large amounts of substrate variations to be completed in days instead of months. 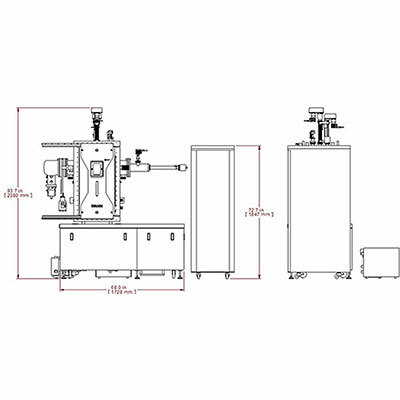 The KJLC wedge tool can help deposited films of material with n number of variations in addition to shadow mask. n is number of columns and its width can be programmed. The substrate can be ROTATED 90, 180 or 270 degrees in the cassette and repeat the above wedge operation. Using the KJLC dual wedge tool in combination with the rotation/orientation of the substrate will result in nxn depositions. In example given a total of 36 can be prepared with straightforward operation of the dual wedge and substrate rotation. View information on major components regarding your product. Reviews the influence of co-deposition on the performance of CuPc/C60 heterojunction photovoltaic cells using our SPECTROS™ System.